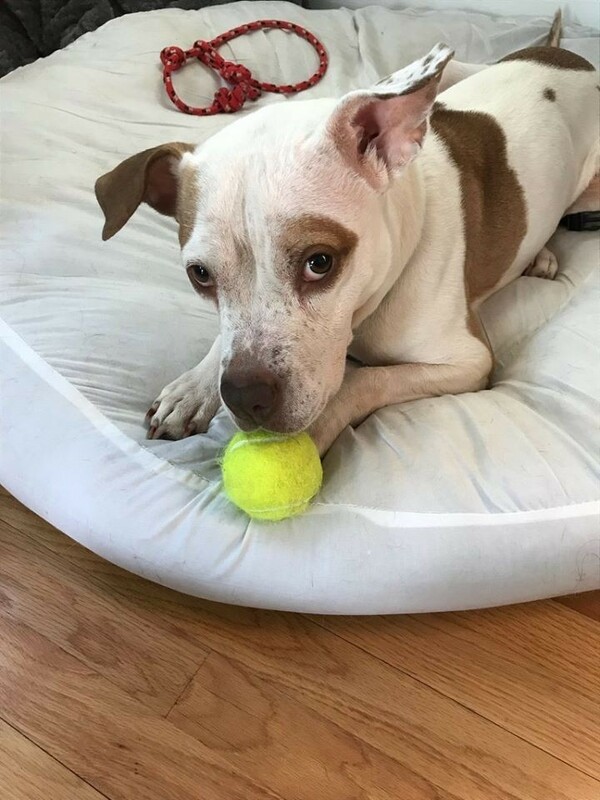 **Hyde Park, MA 02136** Valentine’s Day may be a few weeks away but our sweet vanilla and butterscotch Sasha is ready to steal your heart TODAY. Just one look into those baby brown eyes and next thing you know you’re in love. This 6 year old AmsterDog is a pretty little lady with a big heart and even bigger dreams. You see, she was emaciated at 24 lbs. when animal control found her, but she is now all filled out and healthy. At night, when Sasha is sleeping, she dreams of her forever family. She sees herself cuddling with them, reassuring her that she is home because she’s a smart, sensitive lady that just needs a reminder that “It’s OK!”. She sees herself sneaking naps with her humans when they doze off watching their favorite shows. She’s not picky about her choice of TV but we have feeling Sasha is a fan of rom coms. She sees a whole room full of tennis balls (ok maybe just a basket) and playing catch with her family. Sasha loves her naps, but this lady likes her exercise too. Wow, this is one long dream because Sasha also sees just a few furry friends. After all she went through we think she would be better in a home where she’s one of the few animals or a pretty chill environment. She might be OK with a bigger crew after a while but she is still unwinding from that scary city shelter. Sasha sees giving and getting lots of love from her family and being silly at the same time. Sasha might not see this in her dream, but we had to add that she is occasionally guarding her food slightly. An easy adjustment but hey, who wouldn’t be like “Hands off my meal” if you didn’t know where your next meal was coming from. This dream sounds pretty sweet so let’s make it come true for this beautiful pup and come fall in love with Sasha! Sasha is spayed, up to date on shots and microchipped. To meet this sweet girl, please contact AmsterDog at 917 689 8414 and Thanks! for caring about a sweet girl in need!